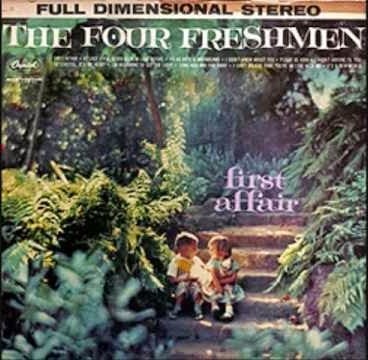 I heard "Polka Dots and Moonbeams" by The Four Freshmen on the radio over the weekend and found it charming. This song was on the 1960 album First Affair. The Four Freshmen were a vocal jazz group that had wonderful harmonies. They have an old fashioned sound and remind me of some of the great Big Band era vocalists. This song was originally recorded by Frank Sinatra with the Tommy Dorsey band, and there was even a Polka Dots and Moonbeams fabric pattern promoted to go along with the song. I love everything about this song ... it sounds like something that would have played at a dance on Father Knows Best. Can't you just picture Betty Anderson slow dancing with a prom date to this number?